Tastefully done and polished, this Blog / Magazine WordPress theme is for all you food, fashion and lifestyle bloggers out there. If you have an expensive taste, love the bling or indulge in the latest culinary adventures the Rich Taste theme is exactly what you need to present your content. The featured posts section makes sure that your best content never gets lost and the WooCommerce integration allows you to easily add your own or affiliate products to a shop section and work the “shop the post” strategy to its fullest. 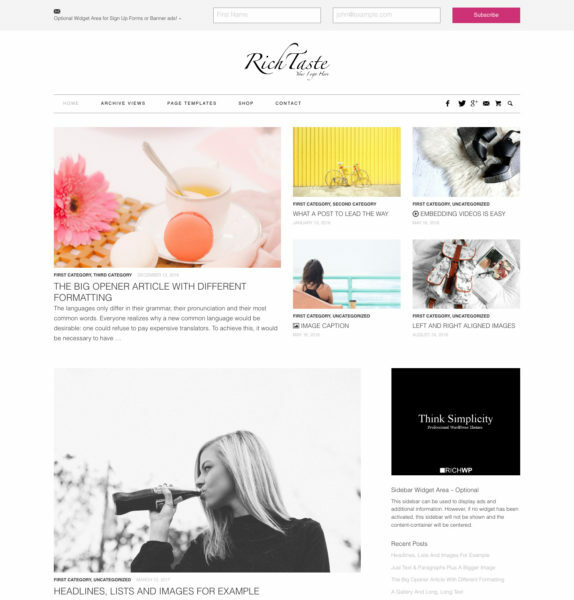 Rich Taste is a Fashion & Lifestyle WordPress theme which is fast performing and easy to work with. It is a solid choice to step up your game and elevate your blogging career. Installing the Rich Taste Theme is as easy as it gets. Check the Installation & Setup Guide no need to break into a sweat. Get your site elevated with the Rich Taste Theme today. Your success will be accelerated. It′s your turn to make headway!